I decided to build a binary release of RapCAD so that people can have a look at how things are coming along without having to compile it. Its very much in a pre-alpha state so don’t expect to be able to just try out your latest greatest design and just expect it to work. Furthermore it can’t currently create any output in the form of an STL file or GCode, so it really is just a release that will let you preview a design. That said there are some nice features that I would like people to try out and see what they think. Language features such as true variables and functions with bodies seem redundant now when other projects such as openscadpy are boasting full python language integration. 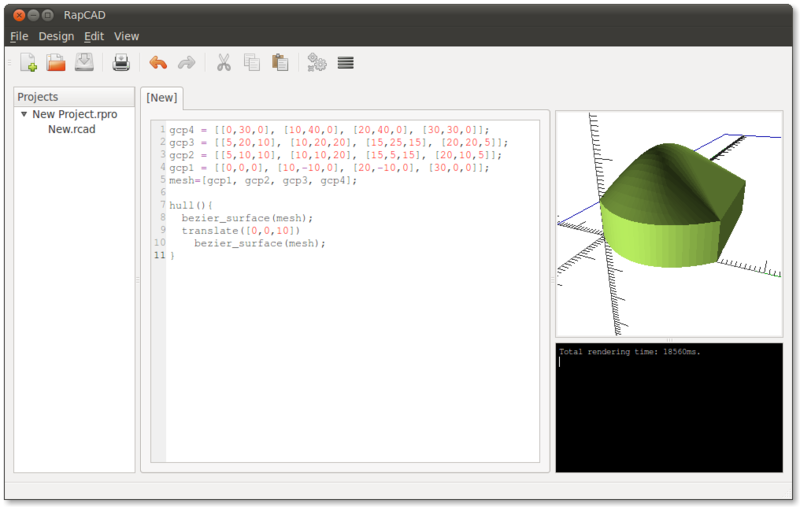 Having said that RapCAD scripts and OpenSCAD scripts are a DSL which is nice to use and since it has no general purpose language features such as reading or writing files, network access, etc. The scene descriptions are inherently more secure. While the authors of the software RapCAD, OpenSCAD and openscadpy are known and trusted, the authors of scene description scripts uploaded to to Thingiverse may or may not be trusted. By limiting the language features to the domain of scene description this mitigates any risk. The linear_extrude is not quite working the way I would like yet, as currently it evaluates it by creating a volume for each facet and doing a union of all of these volumes. With it taking 2 seconds for each volume union, the total rendering time is a completely unacceptable 39 minutes! I would like it to work by just creating one volume, but I haven’t worked out how to find the perimeter of the Bezier surface yet. On the other hand creating a convex hull of two Bezier surfaces works at a comparatively much more acceptable speed, about 18 seconds. This is great news/progress. I would not worry about the Python thing. 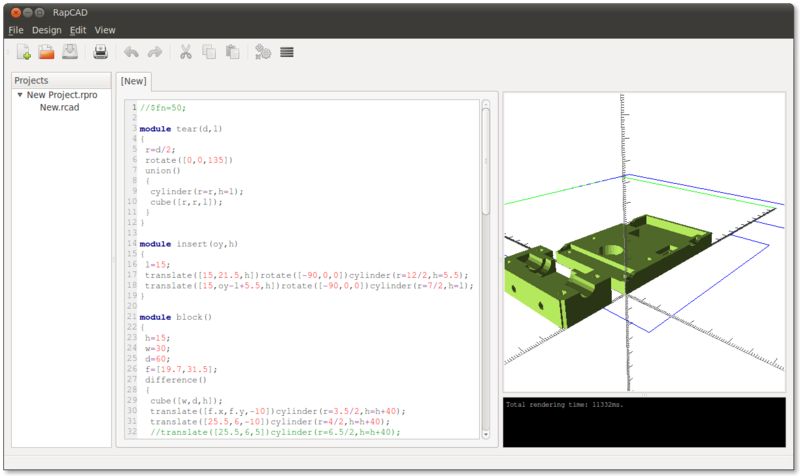 I personally don’t program in Python, and prefer to have a purpose built language such as OpenScad/RapCAD. That version creates one giant volume, eliminating the internal walls. The edge is pretty easy to find, it’s the boundaries of the curves at u==0, u==1, v==0, v==1. There is an answer now so I am going to read it. You can pull ou the bez03, 13, 23, 33 calculations as the same value of ‘u’ is used repeatedly. That will speed things up quite a bit I think. I put some timing around that part of the code and this optimisation saves 7ms. you’ve supplied natty and oneric pkgs. Firstly no, this is not name calling. The point I was trying to make is that openscadpy combines the power of python into a language like openscad. Typically RapCAD and Openscad scripts are safe as they are mearly a scene descriptive languages, they have no power to modify files, implant viruses, steal passwords, or anything else that a python program could potentially do. Usually you would take an evaluated risk when using any python script, you might trust the author, or you might read over the scripts source to decide if its malicious or not. Since RapCAD and OpenSCAD are not general purpose programming languages the possibility to have a malicious intent within the script is not viable. The “script kiddy” in this post does not refer to a known person such as marius, clifford, or any of the authors of openscadpy for that matter, it refers to a malicious author of a python based scene description intended to be used with openscadpy. Some mention about how to build this app from a git clone would be helpful. Previous Previous post: RapCAD is Rendering! Next Next post: How RapCAD will do CAM.